Kettering has a very proud history in the fight against slavery, with William Knibb from Kettering and John Smith from nearby Rothwell playing a significant role in the 19th century campaign for the abolition of slavery. It seemed very fitting that the Kettering Branch of then Co-operative Party should involve itself in the current campaign against Modern Day Slavery. We commenced our campaign by deciding to hold a street stall in Kettering, handing out a flyer reminding people of our history, setting some details about the local issues around Modern Day Slavery in Northamptonshire and Kettering and also asking people to sign a petition calling for the Kettering Borough Council to sign up to the Co-operative Party Charter. 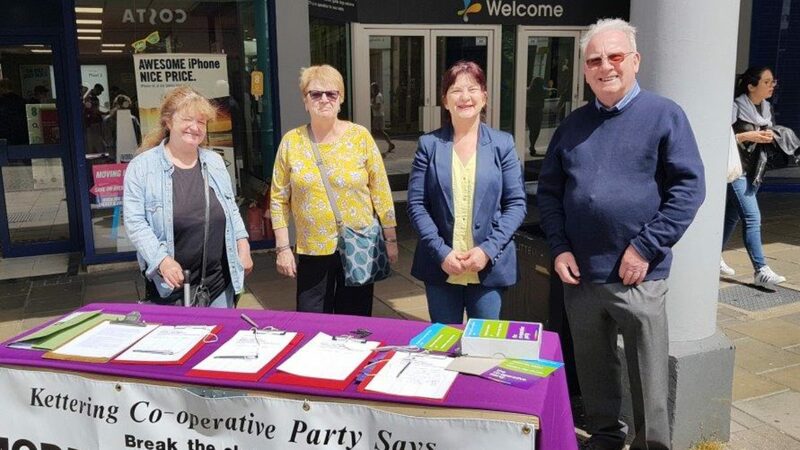 The street stall was supported by members of the Kettering Branch and was well received by the general public with 88 people signing up in just 2 hours on a Saturday morning. The leader of the small Labour group (just 7 members, 4 of whom are Co-operative party members) on Kettering Borough Council came to the stall and informed me that he had submitted a resolution to the Council on this issue, using wording he has picked up at a recent Labour Local Government conference. I had previously met with him at a meeting to discuss items for the 2019 local authority elections when I gave him the 10 suggestions from the Co-operative Party which included reference to the Modern Day Slavery campaign. He asked me to speak at the full council meeting where the resolution was due to be discussed. Although the resolution did not meet all the Co-operative Party Charter points, it did meet with the most important ones. I agreed to speak at the meeting to support the resolution, and handed in our petition a few days prior to the meeting. I judged that this would be the best way to get a commitment from the council to take action against Modern Day Slavery and felt that to get them to formally sign up to our charter would probably be a step to far for this Tory dominated Council. The outcome was that I spoke at the meeting and the Council accepted the resolution, one of the very few times that they have accepted anything from the Labour Group.